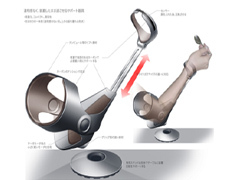 Assistive robot arm developed under the collaboration with Gifu University / Yano Research Institute. 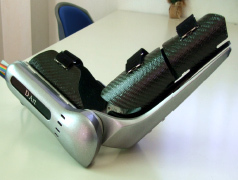 We think of assistance robot is practical intended for sale, not just in research materials. 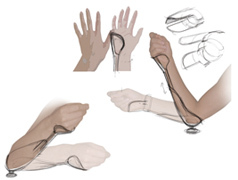 We are developing arm robots feel intention of handicapped person in pressure sensor, and support the movement with a motor. It is almost harness rather than a robot, we researches the future model robot which is near the sense of wears glasses in the future. A lot of handicapped persons can move one's arm which necessary to life by practical use, and they will be able to live and work. Also effective in the rehabilitation of homes, number of times to go to the medical institution decreases. 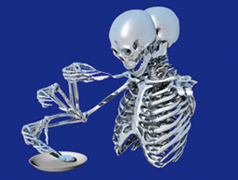 We believe that it will reduction of the problem and working smoothly in Japanese society in the near future. 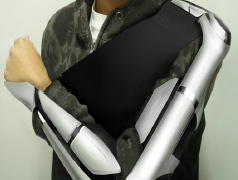 Two years pass after we participated in the research of the arms support robot, it close to the practical level. 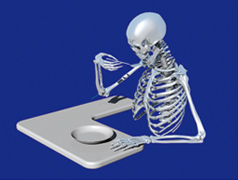 In a request from large companies that want to sell, it is at the pursuit stage for practical use. 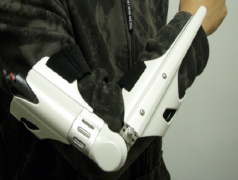 As for people with disabilities in both arms represented by spinal injury patients, robots will communicate using precise signals of Force Feedback. 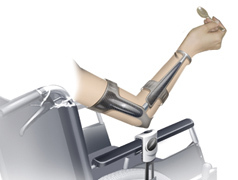 The hand will move for meal and work are supported with the robot. 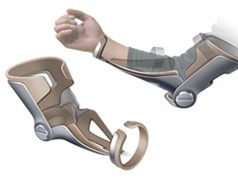 Feel intention of handicapped person in pressure sensor, and support the movement with a motor. The combination of a soft inner, correspond to the arms of the various people.